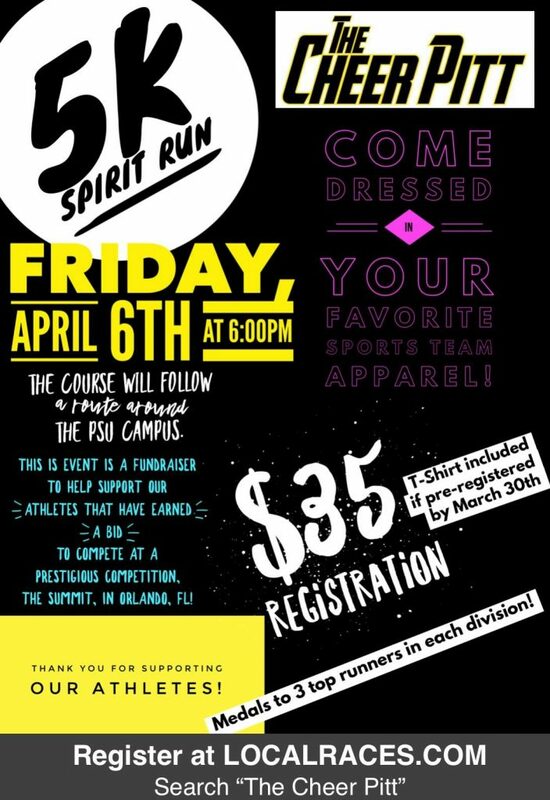 The Cheer Pitt 5K Spirit Run is a fundraiser to support athletes who have earned a bid to compete at the prestigious Cheer Summit competition in Orlando Florida. Join us to support them in their efforts. Only 7% of all All Star Cheer teams earn a bid to compete at The Summit. Come support Pittsburg athletes and get your spirit on! Participants are encouraged to sport their favorite team’s sportswear. Prizes will be given to those showing the most spirit during the race. Medals will be awarded to the top finishers in each age category. The race starts outside of the Weede Gymnasium at Pittsburg State University, and the course runs through and around the campus. Chip timing will be used. Packet pick-up will be available at 5:00 pm the evening of the event, outside of the Weede Gymnasium.